2011 BMW R 1200 GS Adventure. Picture credits - BMW. Submit more pictures. Some journeys you can tell are going to be tough just by looking at the map. B�ut the reality is always going to be tougher. 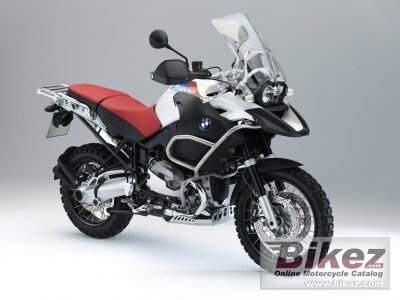 And that�s where the new BMW R 1200 GS Adventure comes into its own. However far you have to go, whatever the terrain, this is a motorcycle that will never let you down. Price as new (MSRP): US$ 17000. Euro 14550. UK � 11350. Prices depend on country, taxes, accessories, etc. Ask questions Join the 11 BMW R 1200 GS Adventure discussion group or the general BMW discussion group. Bikez has discussion forums for every bike. View comments, questions and answers at the 2011 BMW R 1200 GS Adventure discussion group. You can sign up for e-mail notifications when other riders answer you. If you have extensive experience with the MC, please send us a review. If you consider buying this bike, you should view the list of related motorbikes Look at photos. Compare technical specs. And check out the rating of the bike's engine performance, reliability, repair costs, etc. You can compare the rating with other bikes.